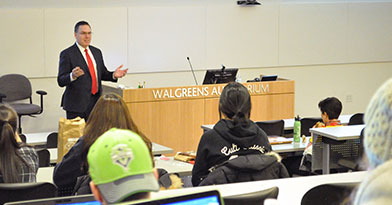 SPOKANE, Wash. – On March 29 Pharmacist Michael L. Brandt spoke with Washington State University (WSU) student pharmacists about the changing landscape of the profession and how they can fit into this new role. “As we grow, things change,” said Brandt. He described how careers in pharmacy have significantly changed since he entered the workforce. SPOKANE, Wash. – On February 22 residents Arsalan Shah and Matthew Elamparo spoke with students at the Washington State University (WSU) College of Pharmacy about their experience in the Fred Meyer Community Pharmacy Practice Residency. “This residency gives you an amazing opportunity to see all the aspects of pharmacy,” said Elamparo. Both residents shared that this residency gave them a mix of experience in patient care, management and administration, transition of care, dispensing operations, and networking. 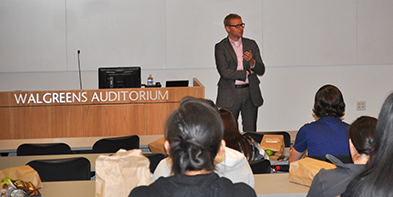 SPOKANE, Wash. – On November 29 Lars-Ake Soderlund spoke with Washington State University student pharmacists about the Sweden national project, Check My Medicines, and the future of pharmacy practice. The Check My Medicines project is an educational application for patients to learn about their prescriptions. SPOKANE, Wash. – On October 19 Lisa Chamberlain spoke with Washington State University (WSU) student pharmacists about the benefits of a pharmacy residency. “When you decide to do a residency a lot of doors are opened in your career,” said Chamberlain. She discussed the many benefits of completing a residency such as developing a network of professionals, building your knowledge base, having an opportunity to explore different specialties, and becoming more competitive in the job market. “If it doesn’t challenge you, it doesn’t change you,” said Chamberlain. 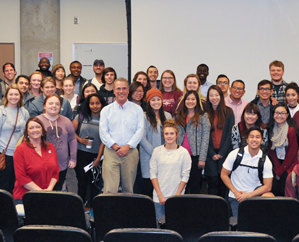 SPOKANE, Wash. – Steve Singer spoke to student pharmacists on October 6 about his career path and the many job opportunities in the field of pharmacy. His presentation was part of the Preparing for Your Career in Pharmacy seminar series coordinated by the Washington State University College of Pharmacy. “You are in control of your career,” said Singer. He advised students to participate in pharmacy organizations to broaden their network and gain exposure to different career options. SPOKANE, Wash. – On September 6 Katrina Mealey spoke with student pharmacists about dispensing medications for veterinary patients. Her presentation was part of the Washington State University College of Pharmacy’s Preparing for Your Career in Pharmacy seminar series. “Dogs and cats are not small people; and cats are not small dogs,” said Mealey. She discussed medications that are prescribed to animals and how they should not be treated like human patient prescriptions, as this can have serious, even fatal consequences for veterinary patients. 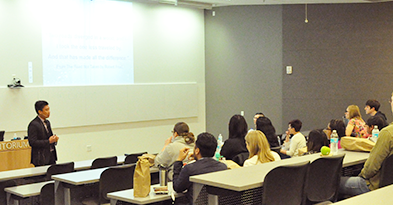 SPOKANE, Wash. – On April 6, Pharmacist Patrick Tabon spoke to Washington State University student pharmacists about his career path and how to handle challenges that come up along the way. His presentation was part of the Preparing for Your Career in Pharmacy Seminar Series, which is hosted by the College of Pharmacy. 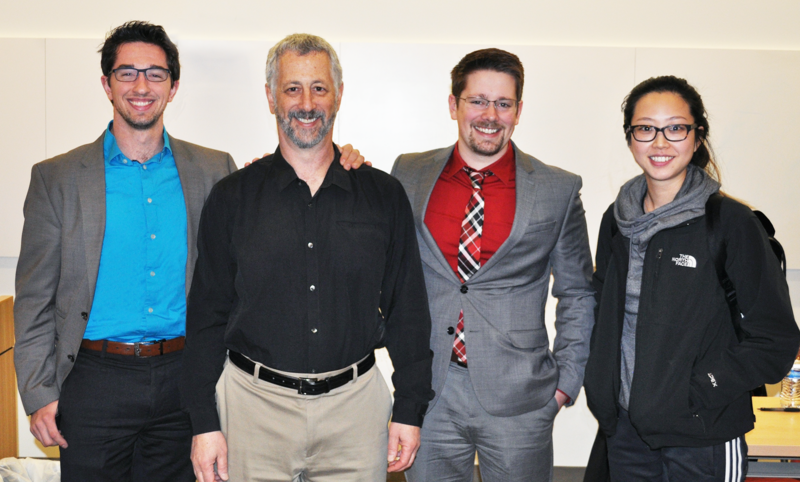 SPOKANE, Wash. – On March 8 Washington State University (WSU) College of Pharmacy alumnus Brian Courtney spoke to student pharmacists about his career in the compounding industry and his work with Fagron. Although compounding has been around for centuries, new regulatory actions have changed the product flow. These regulations ensure drugs are compliant and safe, said Courtney. 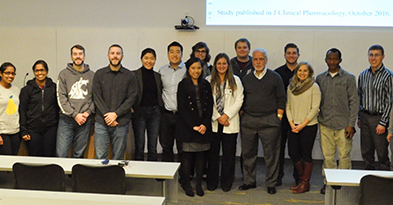 SPOKANE, Wash. – Philip Krieter spoke with student pharmacists from Washington State University College of Pharmacy on November 2 about his work on the development of Narcan® Intranasal Naloxone formulation for opioid overdose. 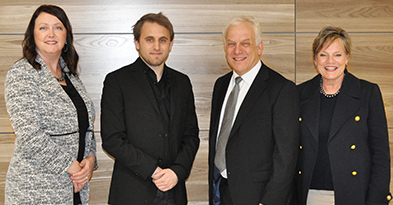 Krieter works in the Division of Therapeutics and Medical Consequences at the National Institute on Drug Abuse (NIDA). SPOKANE, Wash. – Alex Adams, executive director of the Idaho State Board of Pharmacy, spoke to student pharmacists on September 22 about the expanding roles in the profession. This presentation was part of the Washington State University College of Pharmacy Preparing for Your Career in Pharmacy Seminar Series.